Home » Uncategorized » “Fossil Free Agriculture” ESC open position: apply now! “Fossil Free Agriculture” ESC open position: apply now! Do you have an affinity with activism and grass roots organising or campaigning on agriculture and food issues? Are you concerned about climate change? We are looking for one person to join the ASEED team in Amsterdam for a period of one year, starting in January 2019 as an ESC-er (European Solidarity Corps). If you are an EU citizen not older than 30 years, speak English, and would like to join us, then maybe this is something for you. Read more below and get in touch! ASEED Europe (Action for Sustainability, Environment, Equality and Diversity) is a small grassroots action and campaign group, with people from various parts of Europe working and volunteering in the office in Amsterdam. ASEED targets the structural causes of environmental destruction and social injustice. At the same time, we also promote sustainable alternatives. Our general campaign goal is to promote food sovereignty / food autonomy. We support the rights of individuals and communities to determine their own lives and so we work with groups which promote local democracy and social justice as well as taking these principles as a starting point in our own campaigns. Our commitment to equality is reflected in our non-hierarchical working practices, whereby decisions are made by consensus. 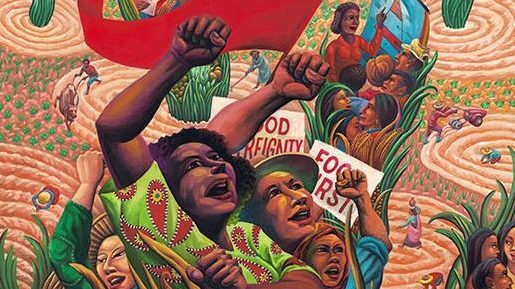 Under the umbrella of the Fossil Free Agriculture campaign, our work is currently focusing on the links between food systems and climate change. We regularly organise or participate in activities within those fields such as information sessions, action camps, festivals such as the Food Autonomy Festival, European exchanges, etc. ASEED collaborates with various groups and initiatives, from the local to the international scale. Examples are collaboration in the Behoud Lutkemeer campaign, the Free the Soil campaign and active participation in the Monsanto Tribunal. Your main task will be, together with the ASEED team, to help build the Fossil Free Agriculture campaign. Here you can find more information about the ideas and goals in this campaign. participating in general in ASEED office tasks. The position will be based in Amsterdam, at ASEED’s office, from January 2019 to January 2020. ESC provides a relatively low budget and can offer a small financial compensation. We will also help you with finding accommodation in Amsterdam. If you are interested, please send your motivation letter and CV to: info@aseed.net. The deadline is November 5th. Short-listed candidates will be notified and invited for a (skype) interview to be scheduled the following week. Contact us by phone or email if you have any questions.